Oktoberfest is one such festival. Since 1810 it’s been the largest annual ‘Volkfest’ (beer festival) and currently attracts six million beer lovers from all corners of the globe. 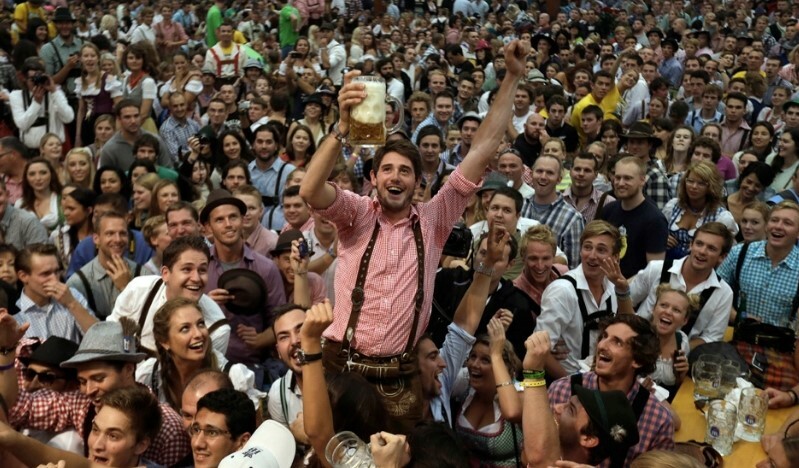 This year they will flock to Munich, Germany to spend a whopping two weeks at the stalls, consuming beers of all kinds and a myriad local foodstuffs; they’ll indulge in games, dizzying amusement rides, and more. German food can be pretty enticing and there’s a lot of fun to be had in cooking it. Why not put on a buffet of German delights? You can even rope some friends in to help you with the preparation with the excuse that they’ll be learning something new and it’s all part of the fun! As well as devouring Deustchland’s delights, you can take a leaf out of the German songbook with some of the country’s best-loved folk songs and put on a selection of beers for your very own home beer tasting session. Popular German beers are a bit of a mouthful, in more ways than one! It should be fun trying to pronounce them after you’ve consumed a couple; Aktien Brauerei Kaufbeuren Jubilaums Pils, Aldersbacher Kloster Weisse Hell and Aktien Brauerei St. Martin Dunkler Doppelbock may well have your tongue more twisted than a ‘Brezen’! 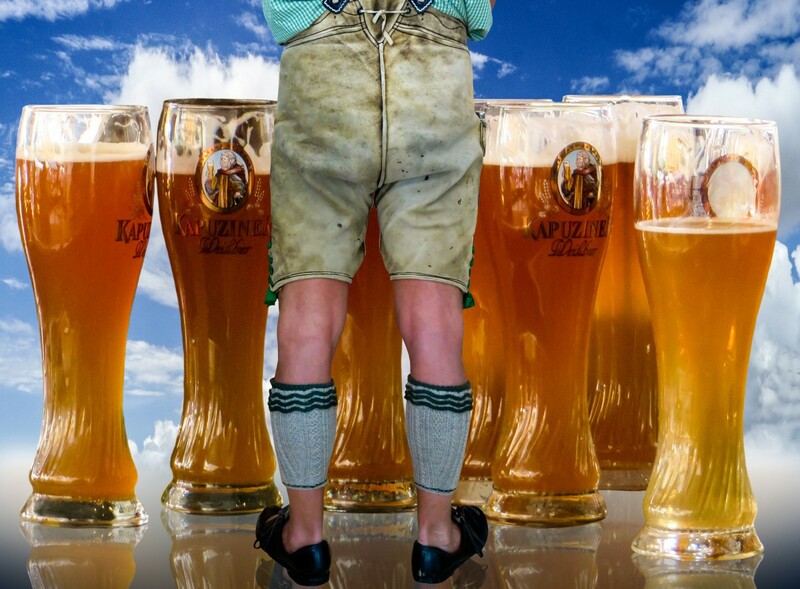 Authenticity will certainly go a long way toward perfecting your celebrations, so don’t forget your lederhosen! This traditional German clothing will no doubt be adorned by many festival-goers and it’s great fun to dip into the old German culture this way. For men, lederhosen often consists of brown or leather shorts and strapping braces, with a top and a hat. Your top might be a stylish gingham shirt – and don’t forget to pull your socks up to your knees! For the ladies, it’s similar, but sexier; shorter shorts or a frilly skirt with petticoat. With this you can opt for braces, or go for a pretty dress. Stockings are likely to be far more appealing than socks! Check out our How to Dress like a German Guide. 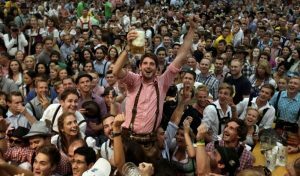 Australian universities sparked a trend when they got their own Oktoberfest celebrations going, with pubs and restaurants soon following suit and some huge Oktoberfest events like Oktoberfest in the Gardens starting up in Perth, Sydney and Canberra. 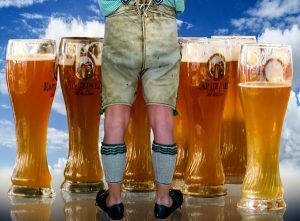 It’s no secret that Australians enjoy a good beer, so neither is it a surprise that so many local brewers offer German style beers throughout the Oktoberfest period. Brewers Feast at Abbotsford Convent could well be the craft beer festival you’re looking for, if you like the idea of the finest Victorian craft beer, gourmet food or live music. Munich Bauhaus in South Wharf Street is all set to help you celebrate Oktoberfest with German-inspired foods, beers, competitions and party packages. Book in advance to avoid missing out! The idea of learning German dancing may have you raising an eyebrow, but although it sounds, well… a little corny perhaps, it’s actually great fun! No excuses… there are countless clubs and dance studios ready to bend over backwards to teach you the tradition of Bavarian dancing. There are even some entertaining Youtube tutorials if you want to learn the ‘Schuhplatter’ (slap dance) at home; what better excuse is there than Oktoberfest to get into your Lederhosen and show off your best slap dance on the beer hall dance floor… or pub table?! Don’t have any Lederhosen? Don’t worry! Creative Costumes have you covered… pop down or check us out online for the perfect traditional German clothing for the occasion. We’ve got a full range of high-quality costumes, so we guarantee you’ll be a big hit!